Well, hey there! I’ve missed you. Apologies for the long absence, but we’ve been in the process of resettling to the Dominican Republic, so cooking and blogging have taken a back seat for a while. But, we’ve finally made it down here and we’re slowly getting settled in – which means getting our new (significantly-larger-than-the-teeny-tiny-one-in-DC) kitchen up and running! Two of my favorite fruits that are widely available down here are mangoes – which are about to come into season – and pineapple. Both are so sweet and delicious it’s almost a sin! 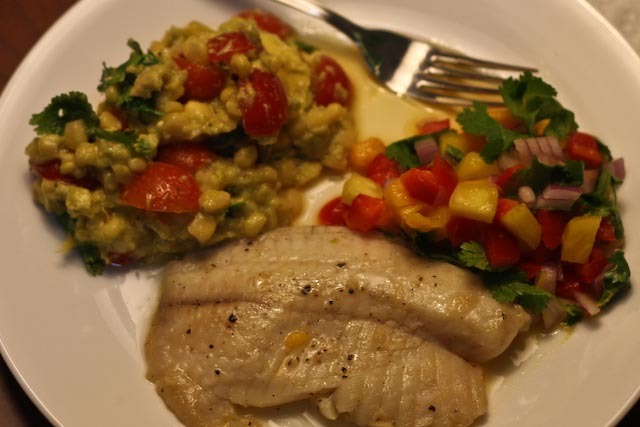 I decided to make a refreshing salsa to go alongside a nice, light fish like tilapia. 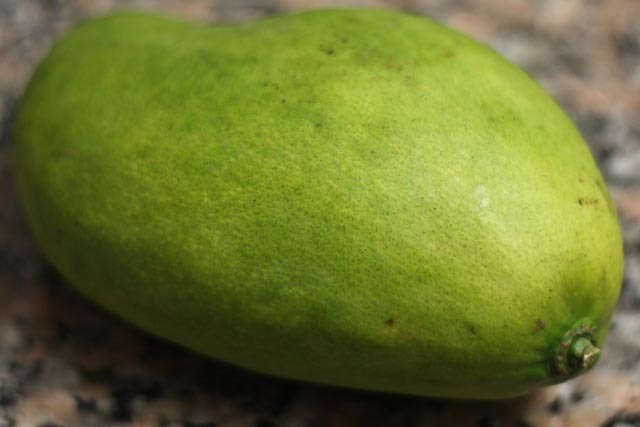 This mango is green on the outside, but it’s actually ripe on the inside. It’s a slightly different variety of mango than you find in most U.S. grocery stores, but it has a very similar taste. Since mangoes are so slippery and somewhat cumbersome to cut up, I often use this trick: I stand the mango upright and find the widest part (that’s usually where the pit is). I then cut from the top all the way down on one of the sides of the pit (parallel to the wide part of the fruit). 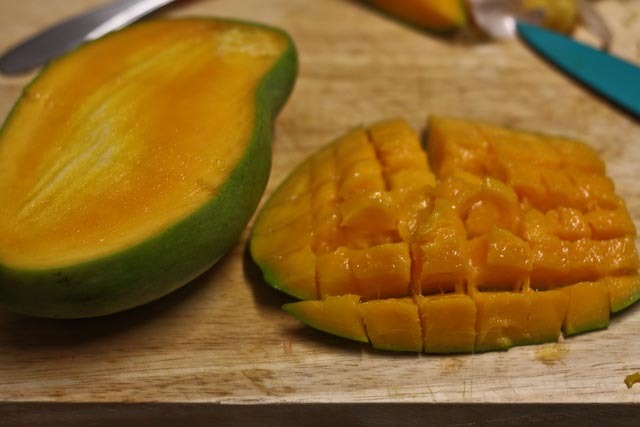 Using a sharp paring knife, I slice the mango flesh both ways without cutting through the skin, and then using the same paring knife (and over a bowl), I carefully slice along the skin and underneath my cubed pieces. This way I get small pieces of mango, but there’s a lot less slippery mess and peeling involved. This is just the way I do it, and there are probably better tricks out there, so you do what works best for you. I had already cut up the pineapple the day before, so I don’t have photos of my process, but I do have a trick for cutting up pineapple too. I usually lob off the spiky top and the bottom of the fruit. With the fruit standing upright, I take a paring knife and cut from the top of the fruit to the bottom down the side as close to the spiky skin as possible while still getting the spikes out of the fruit (if you miss a few spikes, you can come back for them later). I repeat this process until the whole thing is peeled. Then with a large knife, I cut the fruit away from the core in large pieces (cutting from top to bottom), rotating and repeating until all sides of the fruit have been cut off and only the core remains. I discard the core and then chop the remaining fruit to the desired size. Again, this is just my trick for preparing pineapple, but it works for me! I’ve learned that Dominicans don’t really like spicy foods, so fresh jalapenos can be hard to find in the grocery stores. For this salsa, I would usually seed and dice half a jalapeno to add a little kick to the salsa. It’s still very tasty without the extra bite, but if you like your salsa on the spicy side, definitely add some jalapeno! 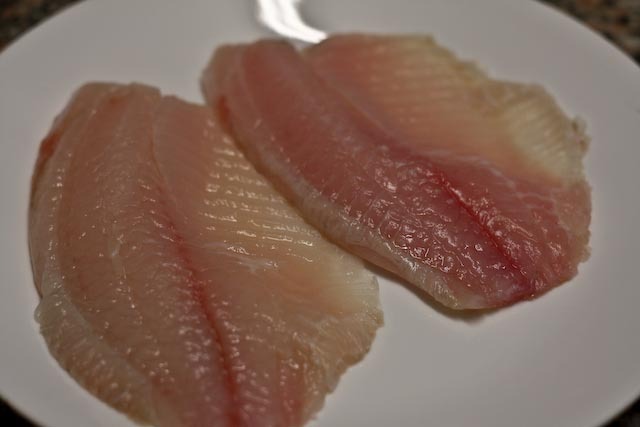 Unfortunately, tilapia is not the most nutritious fish in the sea (although it is high in protein! ), but it’s often very cheap, easy to find, light in flavor, and extremely easy and fast to cook. 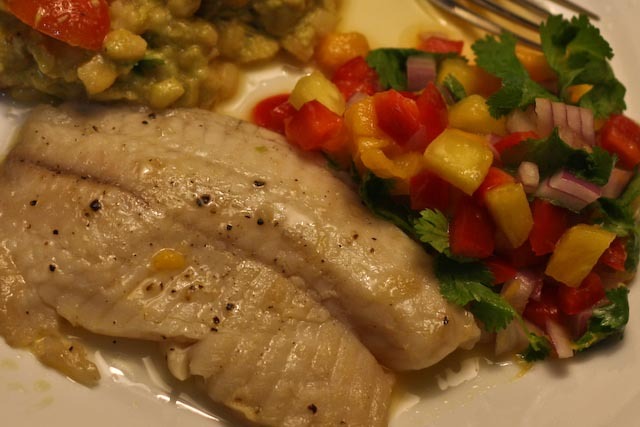 And since the fruit salsa is really the star of the show here, it’s a perfect fish for this dish. All I used to cook the fish was a little lime juice, minced garlic, olive oil, salt and pepper. Super easy, fast, and relatively healthy! I served mine with a corn, avocado and tomato salad. A yummy, fast, and healthy dinner! Heat the oil in a skillet over medium heat. Add the garlic. 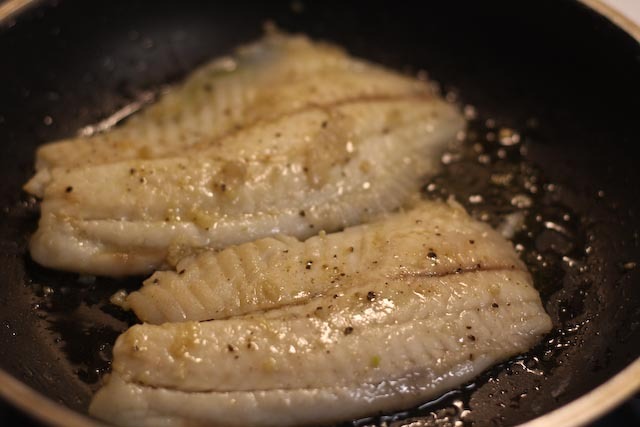 Gently place the tilapia fillets in the pan and season with salt and pepper. Cook for about 3 minutes and then carefully flip the fish to cook on the other side. Cook for another 3 minutes or until the fish is opaque and a bit flaky but not dry. Drizzle with lime juice and serve warm. 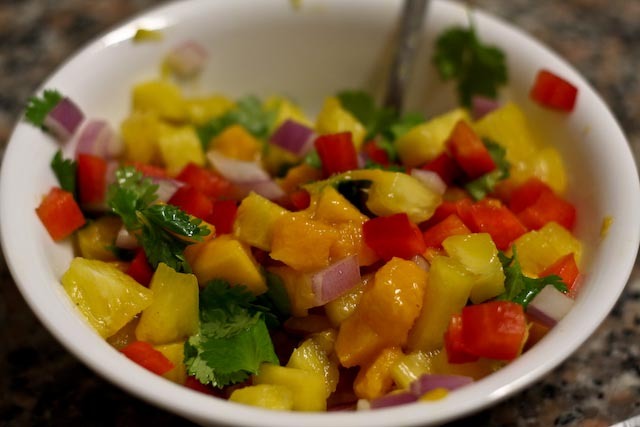 Combine ingredients in a bowl and toss well to combine.